Fairfield, NJ – June 5, 2018 – The leading freeze-dried fruit snack in the nation just got a new look, designed to get your attention and better reflect its wholesome, single ingredient – 100% fruit! The bold brand color palette and added “focus on fruit” was a collaborative design effort by Crispy Green’s brand and packaging design firms, Fastlane Communications, LLC and Foerstel Design, LLC. The new brand launch also includes a completely redesigned website www.crispygreen.com, by the Areli Group, LLC that is architected around 3 C’s – Commerce, Community, and Conversations. Consumers will now be able to zero in on the information they seek – quickly and easily. For example, they’ll be able to find a store in their area that sells Crispy Fruit and instantly discover which items are in stock through the state-of-the-art store locator app powered by Destini. It also includes a Retailer Portal to support its various retail partners. To further amplify its brand evolution, Crispy Green continues to grow its targeted advertising, mobile and digital content marketing programs as well as its brand ambassador and influencer relationships, which are further enhanced through the company’s robust social media activities. This includes continual development and promotion of its consumer food trend, thought leadership and healthy lifestyle website, Smart Lifebites, which provides fun, nutrition and fitness tips, along with yummy recipes and other small “bites” of information viewers could use to make healthier choices. 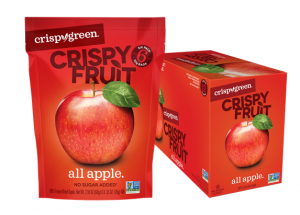 Crispy Green’s Crispy Fruit can be found in many major grocery retailers nationwide as well as through Amazon. Crispy Green is a delicious, convenient way to add more fruit to your daily diet. For more information, visit www.CrispyGreen.com or our sister lifestyle site, www.SmartLifeBites.com. For news updates and special offers, you can also follow Crispy Green on Facebook, Twitter, and Instagram.